Among the most satisfying parts of publishing Hidden New Jersey is in helping people see aspects of the state they haven't discovered on their own. I count myself in that group: for as much as I thought I knew about our very distinctive 8722 square miles of land and water, I'm often finding stories that are totally new to me. Then there are the many natural wonders I've learned about along the way. I've often considered that if I hadn't met Ivan, it would have taken me far longer to learn about the state's birding hotspots and their likely avian visitors. 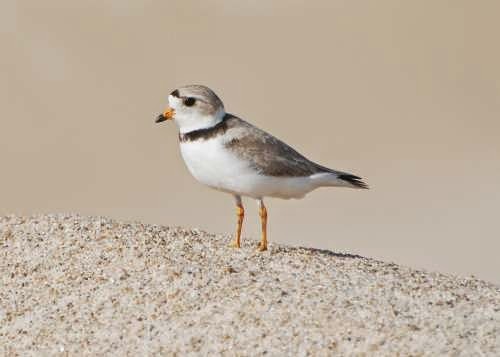 Though the internet and the good work of New Jersey Audubon and other nature organizations have made more information available, wading through it all can be confusing and daunting for a newcomer. Most of the more popular bird guides cover the Eastern United States or the entire continent, and while they have range maps, they're not going to tell you specifically which birds are most likely to show up in your part of New Jersey. I doubt I'd have ever realized, for example, that dozens of warbler species land in my local park during spring migration. As I've learned, having a knowledgeable friend to point these things out to you can make the difference. You can find that friend in the recently published Field Guide to Birds of New Jersey, written by Rick Wright for the American Birding Association (ABA). Granted, the book isn't going to drive you to a birding site and spring for a wake-up Wawa stop, but in many ways, it's like having that experienced birder at your side, showing you the best spots to go and where to find more of that beautiful bird you might have seen in your backyard. You might recall that Rick was our guide on a birding tour of what was once Charles Bonaparte's Bordentown estate, Point Breeze. When he's not treading in the footsteps of noted ornithologists, he's a well-regarded professional birding tour leader, speaker, writer and the department editor for the ABA's flagship publication, Birding. Both in person and in print, he strikes a good balance of sharing his considerable expertise without getting too technical or too basic. Many people buy bird guides for the illustrations and species descriptions, and the Field Guide obliges with lovely photographs and engaging write-ups on 255 of the state's most prevalent and/or distinctive species. A casual reader might just find himself so enchanted by the photo of the Eastern towhee, for example, that he heeds the description's advice to visit Great Swamp National Wildlife Refuge to find one in the wild. That said, the book's greatest strength for the developing birder is its "how to" guidance. Charts at the front of the guide offer an easy reference matching birds to the kind of habitat they like (i.e. marshes, forests, the shore, suburbs and even corporate parks), outstanding birding locales around the state and the birds they attract, and the best locations to bird for each month of the year. ABA birding ethics are included to help newcomers better understand the expected behavior in the field to ensure they enjoy the pastime without endangering the birds. The guide isn't meant to be an exhaustive, stand-alone reference; rather, it's a jumping-off point for additional research if one catches the birding bug. Rick recommends a few key texts, including Bill Boyle's classic Guide to Bird Finding in New Jersey for more detailed information on birding locales, and the National Geographic and Sibley guides for more exhaustive descriptions and illustrations of North American birds. That said, some folks may be perfectly content to use the Field Guide as the reference they keep in their bag on a stroll through the park, or on the windowsill near the bird feeder. While there's a lot to recommend about the Field Guide, there are a few small things I'd hope Rick and the ABA would consider for the next edition. Proper due is given to New Jersey's well-deserved reputation as a birding mecca, but I wish a few more words had been said about the prospect of finding a surprising diversity of species in one's own "patch," whether a backyard or a local park. That, paired with the habitat/expected bird chart, might be a motivator for a feeder-watcher to venture out a little farther, if not to a wildlife refuge. And it would be great to include a species bar chart showing which times of year each species is most represented in the state. Overall, the Field Guide to Birds of New Jersey is a worthwhile addition to the library of the burgeoning birder and the casual observer alike. Highly accessible in tone, very readable and attractively illustrated, it's a great resource to have in one's toolbag while building your knowledge of one of the nation's great birding locales. American Birding Association Field Guide to Birds of New Jersey by Rick Wright, photos by Brian E. Small. Published by Scott & Nix, Inc., 2014. 368 pages, $24.95.